Now here’s the family lore on Bill Vaughan the pilot! To start, it’s January 1940, and I don’t have much from his days at Colby where he was no star student, but he sure spent a lot of time at the Waterville Airport learning how to fly at Airways Inc. His early student pilot log had quite a few pages with instructor Harry Thyng commenting “Bill, got to work on your landings! You’re walking the controls!” He had real trouble fitting into the cockpit of the ‘cubs because at 6 foot 1 inch and 220 pounds and had big feet too, Dad was like a linebacker in a phone booth. He must have gotten both the instruction and the “message” because each of his succeeding log entries had him steadily advancing from student pilot to commercial pilot’s license, then on to pilot instructor himself, all in less than 2 years. The earliest story I recollect was from a cousin, Little Bill, several generations older than me. He was 14 and would go flying with my father while he was grinding out hours in the air towards his commercial pilot license. Sure! Only this was no conventional up and over loop but a forward loop.. I had to think for a minute to visualize the maneuver. “Forward loop”? This was DOWN –UNDER – BACK UP! in a stick, cloth & glue Cub with just a 65 horse Lycoming engine and a wooden prop. It was like diving over the dashboard ‘til your back on the strait and level. My aunt said my father casually flipped the cub upside-down like a corkscrew somewhere over the Isle of Shoals on a flight from Beverly, Mass. to Mount Desert just to see what she’d say. Another time my mother said he flew her upside – down for 20 minutes-like a test- before they were married. They flew from their wedding in Vermont to Rockwood, Maine with pontoons on the Cub landing on Moose River. He would tie the tail of the Cub to a tree and get his friend Martin Munster to cut the rope with an ax when the motor was a full revs so he could get out of the pasture he’d landed in and clear the river and telephone lines at the other end of the make-shift runway. According to family lore, he once flew under the Bath bridge on the Kennebec, drank most of his morning coffee upside down while teaching aerobatics to cadet fighter pilots in Camden, Arkansas and landed his Cub in the back field at “Elm Hill” when showing my mother the farm for the first time. He landed a C-46 on its belly when the wheels wouldn’t go down, a mechanical malfunction and not pilot error. He did a true dead stick landing in Great Falls, Montana with a full load of cement in a C-46 while training to fly the “Hump” (20,000 foot passes in the Himalayas) into China. The instructor gave the order to do a dead-stick landing. Bill took him literally and shut the plane down – COLD! The instructor yelled, “I only wanted you to feather the props!” – Bill landed engine-less like the book said. He flew every single and twin engine plane in the Army Airforce inventory including a jet fighter before 1950. He flew over the farm in a C-47 (Military DC-3) so low that my mother almost “dropped the baby”! 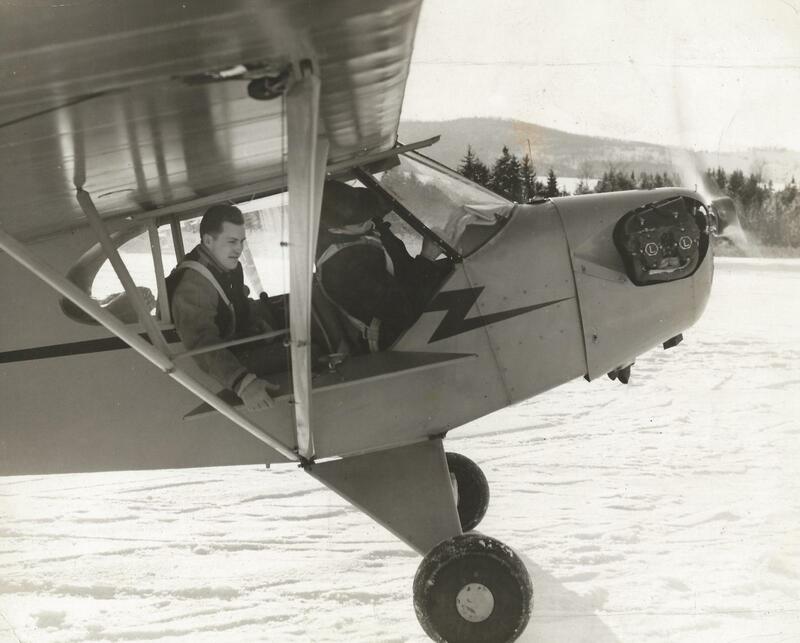 He quit the Maine Air National Guard in the summer of 1950 on the advice of Harry Thyng (a true fighter pilot hero, my father’s first flight instructor and later, four star general). Four kids and a farm were too much to risk military flying anymore. He served, he flew and he had fun, and made a Dad- Hero for his children, even if he did raise the hair on more that a few necks with his flying. Author’s Note: Bill and Margaret Vaughan moved to Elm Hill Farm in 1941. In addition to being a dairy farmer, Bill served as a Hallowell city councilor, and later represented Hallowell for three terms in the state legislature.